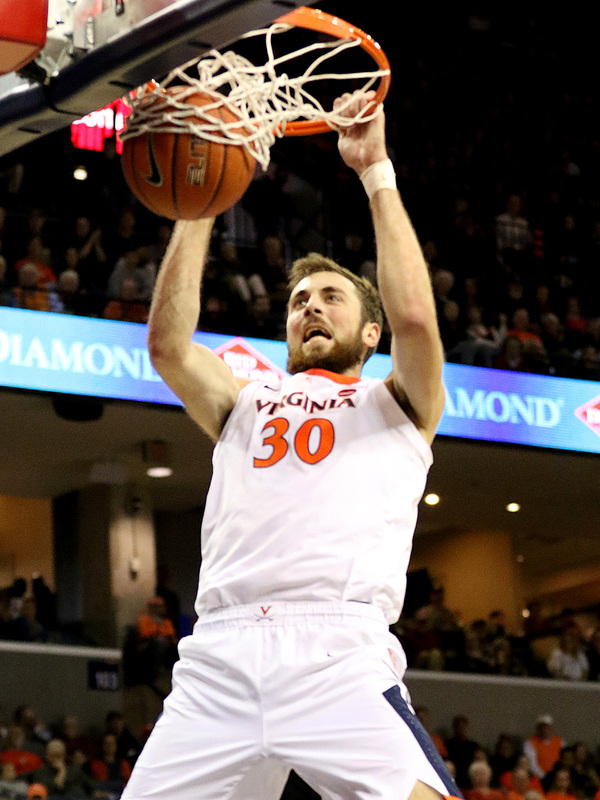 Three days after playing in Boston, the Virginia basketball team headed the opposite direction on the ACC road with a trip to South Carolina to take on Clemson. The games may have been nearly a thousand miles apart, but the results were similar for the Hoos. They shook off an early second half challenge again on Saturday and rolled to a 20-point victory against the Tigers. UVA remained undefeated with the latest win at 15-0. The Double Bonus is back for a look at the latest win from what’s been another strong start for Tony Bennett’s program. The Cavaliers took the lead in the first three minutes at Clemson and never trailed. Junior guard Kyle Guy did the damage early, scoring the first seven points of the game as his team jumped out 11-2. Guy’s first bucket jumped out to me because it came through a wrinkle to an inbounds play that the Hoos have used regularly through the years. They dialed up the call at the 17:40 mark in the first half. UVA put four players in a line across the floor with Mamadi Diakite in the ballside corner, Jack Salt on the ballside block, De’Andre Hunter on the weakside block, and Kyle Guy in the weakside corner. Ty Jerome served as the inbounds passer.